You can now place ads anywhere within individual pages or posts using the new HMT Ads button in the WordPress post and page Visual and HTML editor. By using the [ROTATE] tag within your HeatMap Ad Widget you can combine multiple ads which will change randomly everytime the page is reloaded. Using the [NOCACHE] tag you can even have rotating ads when you are running a cacheing plugin. HeatMap Theme gets a whole new look with these new Pro Skins. Ultimate Authority skins look like they mean business! Your sites will command the respect they deserve. You can now add Facebook Like, Twitter Tweet and Google +1 buttons to your posts. Also Google Plus is now available as a social network button in your nav bar. If you are creating review sites then you will love the new buttons that can be placed on the home page at the end of each post, and featured images that can be automatically linked to affiliate sites. Made the perfect HeatMap Theme setup? Now you can export your HeatMap Theme settings and then import them into new blogs quickly to set up your very own army of HeatMap sites. When used in conjunction with WordPress’s built-in import/export function it makes reproducing sites almost like magic! The new SEO plugin option allows HeatMap to just get the heck out of the way if you want to use an external SEO plugin. If you choose to use HeatMaps internal SEO features then they are now even easier to use. Custom Fields begone! You can now select the post categories to show on your home page, and also limit the Recent Posts Plus widget allows you to select specific featured categories. You can now upload your logo and favicon directly from the options page. All page templates are now available for posts too. There is also a new ‘Page/Post Ads Off’ template which allows you to switch off all ads and sidebars for information pages such as Privacy Statements. You can now add CSS tweaks directly to the theme without editing files. HeatMap Theme allows the creation of Child Themes (aka Pro Skins). If you are an advanced WordPress tweaker you will appreciate the ability to override CSS and template files. The theme itself is fully translatable. 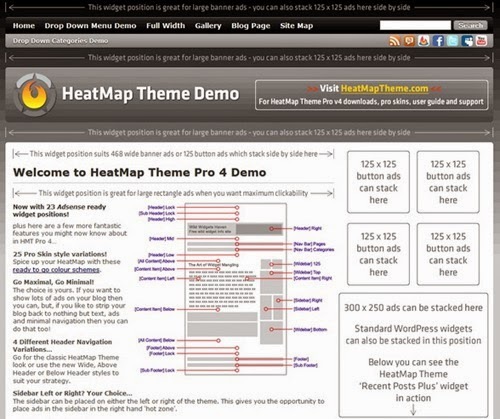 0 Response to "wp-HeatMap Theme Pro v5"